Take the hassle out of end of month claiming paperwork with MedsCK's in-built managed claiming system. Pre-populated Australian Privacy Principles Notification printed at the end of the MedsCheck review for patient to sign. Claim management screen that tallies reviews completed in the selected claiming period. 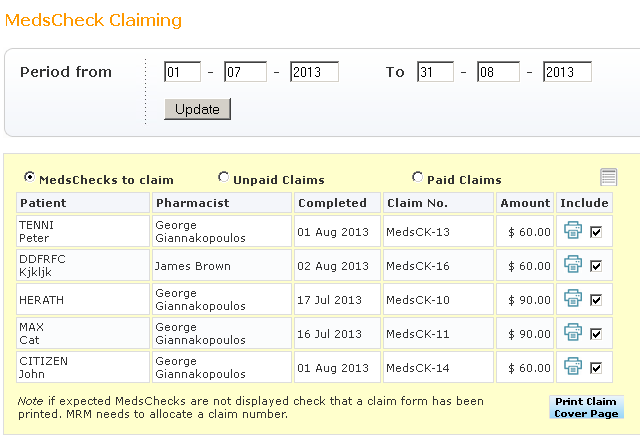 MedsCK automatically generates your pre-filled end of month 6CPA claim sheet with a single click. The completed claim sheet can be submitted directly to the 6CPA claiming portal. Track Medicare claims. Manage unpaid claims or reference the details of any past (paid) claim. Total claim management.